As it does every year during budget season, the Equal Justice Coalition—a collaboration of the Boston Bar Association, Massachusetts Bar Association and the Massachusetts Legal Assistance Corporation—drew nearly 700 attorneys from the legal community January 26 to the State House to lobby legislators for increased civil legal aid funding. Since the November election, civil legal aid programs around the state are dealing with an influx of people seeking assistance from an already dramatically under-funded system. In response, legal aid advocates are seeking a $5 million increase in state funding, which would bring the state’s annual investment in civil legal aid up to $23 million. Gov. Baker has recommended a one percent increase of $180,000 to the current $18 million appropriation for legal aid. While any increase in funding is welcome, the sum is far below what is needed to meet the demand for services in an average year. As it stands now, legal aid organizations statewide are collectively turning away 64 percent of eligible people who come to them seeking assistance because there simply are not enough resources to help them. This year, legal aid organizations are also bracing for potential cuts in federal funding, lending an even greater sense of urgency to the lobby day. Boston Bar Association President Carol Starkey told the gathering that she is concerned about proposed federal cuts not just to legal aid, but to allocations for programs that curb violence against women and community policing programs as well. “It’s hard not to read into those suggested spending cuts as a message that the poor and the disenfranchised do not have an ally in our highest levels of federal government,” she said. Funding shortfalls have real world consequences for families and individuals like Bill, a Boston retiree who abruptly lost his MassHealth coverage due to a system error just as he was about to start a life-saving treatment regimen for Hepatitis C. Despite repeated attempts, Bill was not able to solve the issue on his own. Meanwhile, as time passed, he grew increasingly panicked about his health and the risks of delayed treatment. So Bill contacted Greater Boston Legal Services (GBLS) for assistance. He was connected with an attorney in the GBLS Elder, Health, and Disability unit who resolved the issue within a week. Soon afterward, Bill resumed treatment for hepatitis C and, as he told the crowd at Walk to the Hill, he now enjoys a clean bill of health from his doctor. “When they told me I was healthy, that the treatment had worked—the first person I thought of was [my attorney],” he said. “I know I wouldn’t be here and be healthy without her help. Be sure to watch this space or follow us on Twitter (@equaljusticema) for the latest information and action alerts related to state funding for civil legal aid. Your voice matters! BOSTON (January 11, 2017)―Chief Justice Ralph Gants of the Supreme Judicial Court and bar association leaders will join hundreds of private attorneys from more than 40 law firms at the Massachusetts State House on Thursday, Jan. 26 at 11:30am for the 18th Annual Walk to the Hill for Civil Legal Aid. Attendees of this annual lobby day, one of the largest held at the State House each year, will request a $5 million increase in state funding for programs that provide civil legal aid to low-income Massachusetts residents. Speakers at Walk to the Hill will include Chief Justice Gants, Boston Bar Association President Carol A. Starkey, and Massachusetts Bar Association President Jeffrey N. Catalano. The program will also include remarks by a client who has benefited from civil legal aid assistance. Following the speaking program, attorneys will visit their legislators and urge them to increase funding for MLAC, the largest funder of civil legal aid in Massachusetts, by $5 million in the FY18 state budget, for a total appropriation of $23 million. NOTE: Members of the media are welcome to attend all or part of the speaking program. Please follow the Equal Justice Coalition on Twitter (www.twitter.com/equaljusticema) as well as the hashtags #IWalkForJustice and #WalktotheHill for the latest on Walk to the Hill 2017. The Equal Justice Coalition, a collaboration of the Boston Bar Association, Massachusetts Bar Association and the Massachusetts Legal Assistance Corporation, works to increase state funding for civil legal aid. 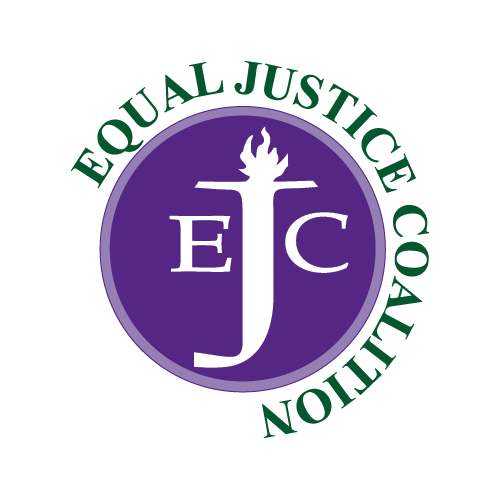 BOSTON, August 30, 2016 – The Equal Justice Coalition (EJC) announces the appointment of Laura Booth as the EJC’s director effective September 14. Laura brings nearly two decades of experience in human services and public policy, most recently serving as campaign manager of the Committee to re-elect State Representative Marjorie Decker. Laura replaces Deborah Silva, who left the EJC in July to become executive director of the Massachusetts Appleseed Center for Law and Justice. Prior to her work with Representative Decker’s re-election campaign, Laura served as Director of Family Services at Heading Home, Inc., and was the Director of Programs at Women’s Lunch Place. She also worked at Rosie’s Place, the Cambridge Economic Opportunity Committee, and in the office of State Senator Anthony Galluccio. Laura earned a master’s degree in public policy from Tufts University and a bachelor’s degree in human services from University of Massachusetts, Boston. The Equal Justice Coalition is a collaboration of the Massachusetts Legal Assistance Corporation, Massachusetts Bar Association and Boston Bar Association. The EJC includes representatives from bar associations across the Commonwealth, law firms, and the legal services community, who work together to protect the state appropriation for civil legal aid, which funds programs that provide legal advice and representation to low-income Massachusetts residents facing civil legal problems. BOSTON, August 4, 2016—State Senator Bruce Tarr of Gloucester will visit Housing Court at the Brooke Courthouse in Boston at 9:30am on Thursday, August 11, 2016. Barbara Zimbel, a civil legal aid attorney from Greater Boston Legal Services, will give the senator a tour of Housing Court, which has jurisdiction over civil and criminal actions relating to the health, safety, or welfare of the occupants or owners of residential housing. They will be joined by Massachusetts Bar Association President Robert W. Harnais, Massachusetts Legal Assistance Corporation Executive Director Lonnie Powers, and Meehan Boyle attorney John Carroll, who is also a member of the Legislative Committee of the Equal Justice Coalition.